He was very exciting about it, although mostly the chopping people in the neck part, which I don’t think they get to right away. Once it was made known to him that he would begin the study of a martial art, he asked every day if it was “the day.” Sadly for him, it was generally not the day. On Tuesday, however, it finally was the day, so we drove over to the place and walked in. Wait, no, I walked in. He fell asleep 30 seconds before we got there, so he got carried in. “Wake up! We’re here!” I said, trying to be the pep squad for the angry raccoon I had just poked with a stick. “Mnnyyyeerrrah!” he grunted, swiping at me with his hand. “Are you ready for Taekwan-Do?” Big smiles. Happy faces. We can do this. Too bad! In you go! We found the class for ages 4-6 and sat down to observe. Wait, observe? Had I forgotten to mention to him that we were only observing this first class, and that he could then sign up and participate at the next one? Uh oh. He did not like this. I tried to hold him in my lap and hush him as he wriggled and squirmed and whined and complained. It was all I could do to keep him from taking off and running into the middle of the other children, lined up in a perfect row with their spotless white robes on. “He’s welcome to come over and participate whenever he feels comfortable,” said the instructor. That was all it took. He was not going anywhere near those kids, now that he had permission. He sat quietly in my lap, still and unmoving, as I urged and goaded and tried to cajole him into joining the other kids. At least he was paying attention now, as they began to play some fun games that basically amounted to a epic game of Simon Says. Run over there! Yes master! Face the wall! Yes master! Go to your mat! Yes master! Run around the room! Yes master! It looked pretty cool to me, but apparently permission is the death of fun. In the last five minutes he finally gave in. There was an obstacle course set up that involved, among other things, a trampoline, so he reluctantly trudged over to the line and ran the course. He loosened up a bit and had a great time, so when I asked him if this was something he wanted to do fairly regularly, he agreed, nay, demanded to be taken back again. Yesterday we returned, registration forms and money in hand, for Edward’s first official day of Taekwan-Do. He got a uniform, and started right up with no transition necessary. One nice thing about this academy is that there is a waiting area with a big monitor where you can view the class doing their thing, so I got to watch him flop around as the other kids stood perfectly still, and I got to see him try to bow, although his bow had a bit more…flourish than the bows of the other students. 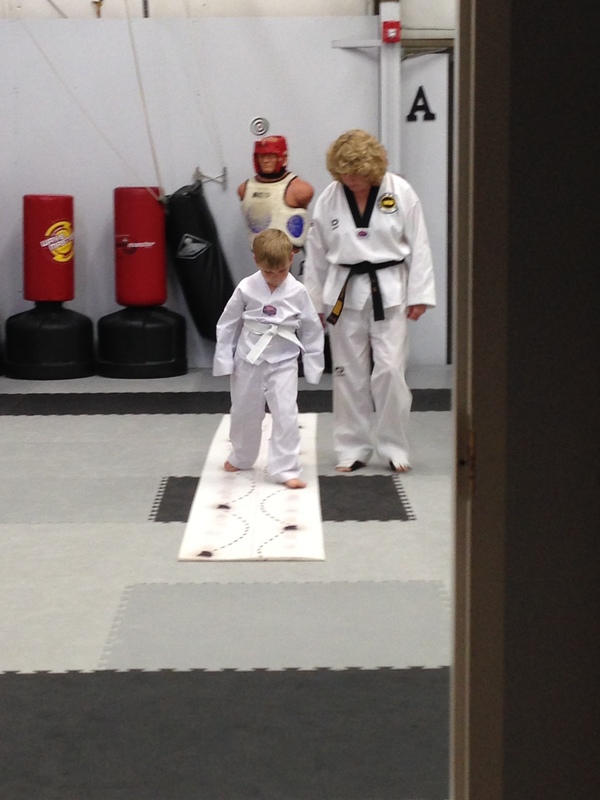 When it was done, it was clear that he had had a wonderful time, and his instructor gave a glowing report, telling me that Edward was great at listening and paying attention and sitting still and following instructions. And the more often he goes, the better he may become at these things! I just hope he doesn’t use up all of those skills during class. It would be nice if at least a few of them came home with him.